Tre Mercati - French Classic Mono Sink Mixer in Antique Brass is a part of the "French Classic" range from Tre Mercati. The French Classic is a traditional range that will bring Opulence and prestige to your kitchen. The Tre Mercati French Classic Mono Sink Mixer has been made to the highest standards using the latest methods and best materials. This classic design comes with standard tap washer cartridges. The Tre Mercati French Classic Mono Sink Mixer has flexy tails which come out of the bottom of the taps, and measure 15mm in length. Hope this helps. Stunning Taps Stunning Service Stunning Delivery What more could I ask ?????????????? Great product ,great service nothing more to say!! I bought this to replace a similar tap which had seen better days. I am very pleased with the quality of the item and would definitely recommend. We had an almost identical kitchen tap that was old and suddenly ceased to function with regards the hot tap. Boiling kettles for water was not a long term option! We found this item, ordered it and it was delivered early the next day. The quality is good,the water power is excellent, the item looks good in our country style kitchen, and the quick delivery was exceptionally welcome. 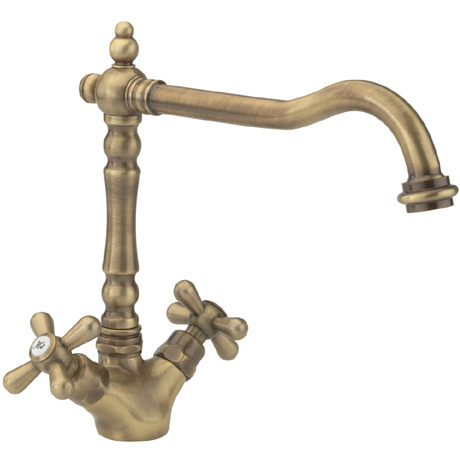 It was expensive but it is a more unusual product style and has more to it than most taps.